A COUPLE OF MONTHS AGO I was sitting over the fence of 80% and 20% of the opinion makers reacting to the possibility of success of the IPL business model. 80% were the sceptics and believed that as it happened with ICL (Indian Cricket League – Chaired by Kapil Dev and sponsored by Zee Entertainment), IPL would find very few takers – perhaps only the useless of the useless lot would devote time to this remix masala version of the gentlemen’s game. 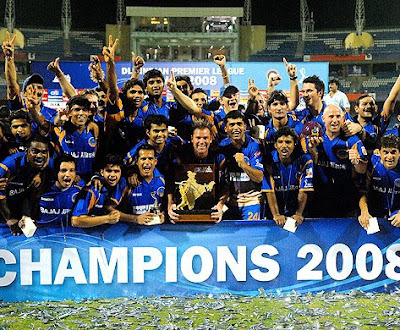 To my mind, both these Indian T20 “cricetainment” versions were not at par: ICL was but a “zee thing”, where as the Premier League had the mind, money and muscle backing of BCCI – an important element that could make it swing and bounce. It appears that this compressed format of the game may not have gone down too well with all quarters of the cricket, especially the British media and "empirical" standards. Lord Archer, for example, has been quoted saying during his hugely successful India tour last month that Twenty20 is entertainment and not a cricket. Lord Archer may offer a dead defensive bat, and silly mid-on and Shane go up in appeal to Billy nonetheless, the whole of the stadium also erupts in asking the same question. That essentially is the appeal of the game. Spectacle. Warne’s squad was considered an underdog on the ground that they didn’t have any star player (and where of the cheapest bidding of the eight during the auction). Somehow, I disagreed with that statement. Rather I considered Jaipur team a real good value-for-money for the bid-winners. Warne is no less than a legend in his own right, and when you have the captain of the South African team also as your opener, you surely have a side to reckon with. If at all someone would want to consider them as starting underdogs, the reason has to be that the total squad didn't had the best of the commercial value at the bidding time. And then again it was the error of judgement on the bidder's part then anything else (one more indication to this effect is that Anil Ambani is rumoured to have backed out of Royal's bidding at the very last moment for Ahmedabad, and the team was won by Jaipur). The real important part, however, was the captaincy by a leg spinner: IMHO successful spinners are born tacticians; shrewd and deceptive in their strategy and their main weapon. This may not be the case with the fast-bowlers who depend on their physical strength for pace more than anything else. Warne’s so-called "role-based approach" to the game might have given him the first IPL success, but it would be extremely difficult for him to repeat it in the comings seasons, and I am almost certain that he is also aware of it. The broadcast rights for IPL for India were sold at USD 1bn. Before the tournament began, even 90% of India was unaware of a Cement brand called Super Kings. Wikipedia had no mention of India Cements Ltd. In 45 days, Super Kings goes on to become a globally known name and brand, and like N. Srinivasan, CEO, puts it, every penny invested in the franchise by them is worth it - No other branding strategy could have delivered within the given time-frame. Delhi Daredevils had the best ROI with their Feroz Shah Kotla ground turning in nearly Rs. 90 to 100 million in gate collections. They are the first franchise to break-even and go profitable. For Shah Rukh Khan, it was a double loss: first, Kolkata lost out, and then the TPR of IPL ate heavily into his newly launched game-show "Panchvi Pass". He is surely praying for the revival of both. Vijay Mallya remained at the receiving end as Royal Challenge as a brand also goes down with his IPL team, and Blender's Pride (Seagram) takes over the #1 spot in sales - almost after a decade.